The play "The Book of Mormon," which opened on Broadway Thursday night, has stirred up some controversy over its satirical approach to the Church of Latter Day Saints. 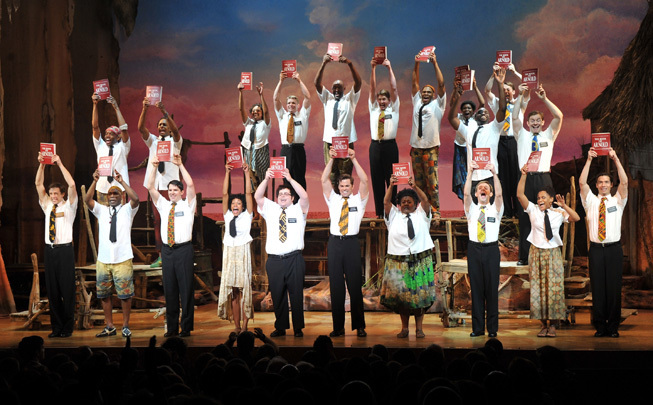 Video: "The Book of Mormon" Offensive? Written by the creators of South Park, Matt Stone and Trey Parker, "The Book of Mormon" examines blind belief in religion through a constant back-and-forth between fantasy and reality. Robert Lopez, who is best known for writing the Broadway hit "Avenue Q," worked with Stone and Parker to create "The House of Mormon." The two main protagonists, played by Josh Gad and Andrew Rannells, begin to question their faith when they are faced with an almost incomprehensible series of unfortunate events. Despite controversy surrounding the arguably blasphemous content of the musical, Lopez asserts to CNN, "What's powerful is not a magical mythical corporeal thing called God," he said. "It's the power of these ideas, and the power of the trust, and the power of the musical. That's where the true miracle is. And the result of the miracle is that people are good to each other."